Infanticide. – We learn that an inquest was held on the body of an infant child found in a branch in Robeson county on the 6th inst. The result was a verdict that the child was willfully murdered by its mother, a free woman of color named Arrah Carter. Fayetteville Observer, 10 October 1853. She is of free parents. North Carolina, Edgcombe County } To the Sheriff of Edgcombe County Greeting; You are hereby commanded that, you Summon Thomas Hodges of your said County if to be found in your Bailiwic personally to appear before the Justices of the County Court of Pleas & Quarter Sessions to be held for the same on the fourth monday in November next then & there to shew Cause by what Right title or claim he holdeth in Slavery, a young Woman of mixed Blood named Bet (Elizabeth) who by Thomas Hall her Attorney Suggests that she is of free Parents & entitled to freedom — And have then & there this Writ; Witness Edward Hall Clerk of sd. Court, the [blank] Day of [blank] ann Dom’o 1780, in the 5th year of Independency Edw’d Hall C.C. Edgecombe County Records, North Carolina State Archives. 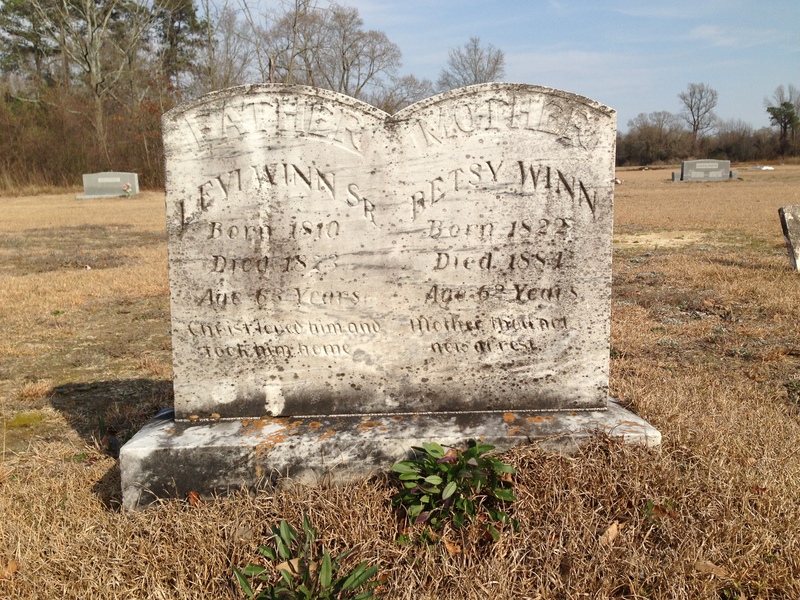 LEVI WINN was probably born in northern Duplin County. Elizabeth, called “Betsy,” last name unknown, was his second wife. They are buried at First Congregational Church in Dudley, Wayne County. Photo by Lisa Y. Henderson, March 2013. In the 1860 census of Buck Swamp, Wayne County: Levi Winn, 47, blacksmith, wife Elizabeth, 39, and children Henry, 21, David, 20, Pinkney, 19, George, 17, Charles, 15, Mary, 13, Martha, 11, John, 9, Elizabeth, 7, Susan, 5, and Levi, 3. He was elected county commissioner. From J.M. Hollowell, “War-Time Reminiscences and Other Selections,” Goldsboro Herald, June 1939. In the 1850 census of South Side of the Neuse, Wayne County: Green Simmons, 33, cooper, wife Betsy J., 26, and children Needham, 5, Cicero, 3, and Mary, 1. All were born in Wayne County, except Betsy, born in Sampson. Born in 1844 in New York of West Indian and Irish parentage, James E. O’Hara migrated to North Carolina after the Civil War with African Methodist Episcopal Zion missionaries. 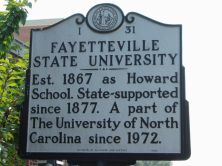 He served as clerk for the 1868 state constitutional convention and was elected to the North Carolina State House of Representatives in 1868 and the United States House of Representatives in 1882. O’Hara died in New Ben in 1905. ALEXANDER, BARBER, BARROW, BERRY, BRACHAM, BRADDOCK, BRAGG, CHANCE, CLARK, CLAYTON, COFFEE, COLLINS, COVEL/COVELL, DAVIS, DYER, ELKS, FREEMAN, GARNER, GORDON, HARRIS, HELLEN, HILL, HUDSON, KING, LONGTOM, LUTTON, MACKAY, MORRIS, POWERS, PUGH, REED, RING, SHELDON, SMITH, SUTTON and TYSON. Near the blacksmith shop on the old road. I, Thomas Hollowell, of the County of Wayne and the State of North Carolina being in feeble health but of sound mind and memory do make this my last will and testament in manner and form as follows: First – I give to my wife all my household and kitchen furniture, my buggie and harness also I have one note I hold against John Hollowell in the hands of my executors for them to pay to her the amount of interest so long as she may live. My will further is that my two sons Jesse and Thomas shall furnish my wife a bountiful support and in case they shall refuse at any time, I wish for her to have a dower laid off on the lands I leave them. Second – I give to my Levi Hollowell two notes that I hold against him. Item 3rd – I give to my granddaughter Elizabeth A. Stanton one note that I hold against her brother Thomas H. Stanton. Item 4th – I give to my grandson Levi H. Massey one acre of land joining Dudley on the south side of the old road near Levi Winn‘s blacksmith shop. Item 5th – I give to my son John Hollowell two shares in the Wilmington and Weldon Railroad Company. Item 6th – I give to my son Jesse Hollowell all the land I own lying on the east side of my Gin Branch also the upper part in the Big Fork down to where the bend of the Branch comes nearest together, and then down the run of Big Fork to the head of the Gin Branch and then to extend down the Canal to the run of Brook’s Swamp except the privilege of enough land near the Gin House at the end of the Gin Dam to put up a cotton screw also two shares in the Wilmington and Weldon Railroad Company, also two lots in Dudley known as No. 5 and No. 15. Item 7th – I give to my son Thomas L. Hollowell all the land I own on the west side of said Gin Branch from the line marked out for Jesse Hollowell to the aforesaid Brook’s Swamp also one share in the Wilmington and Weldon Railroad Company, two lots in Dudley known as No. 13 and 14, and one note that I hold against the said Thomas L. Hollowell. Item 8th – I wish my executors hereafter named to pay all of my just debts out of my estate not heretofore named and given away. Item 9th – My will and desire is that the balance of the amount due my estate in John Hollowell’s hands after paying the interest to my wife during her life and the balance of my estate after paying my debts to be equally divided between my living children and to those deceased to the heirs of their body. Lastly – I constitute and appoint my son John Hollowell and my grandson Levi H. Massey Executors to this my last will and testament hereby revoking all other wills by me made this 25th of 10th month A.D. 1861. Thomas Hollowell. Sealed in the presence of – Mary E. Hollowell, Jesse T. Hollowell. Book R14, Page 239, Wayne County Superior Court Clerk’s Office, Wayne County Courthouse. He has no papers to prove his freedom. Committed to Norfolk county jail, a Mulatto fellow, who says he is a free man, but has no papers to prove his freedom, he is a bright mulatto, 6 feet high; he says he is named JOHN MASINS, born in Washington county, N.C., a small scar over his right eye, and one on his right ear. His owner is requested to come forward, pay charges and take him away. CHARLES RUDDER, Jailor. Where Thunder Swamp Branch crosses the main road. Grantor Book 20, Page 407, Duplin County Register of Deeds Office, Duplin County Courthouse.